These are the moments that electrify the heart of a ski mountaineer. To be here, on snow, with skis—I don't know how to even begin to describe the feeling. Iron Mountain's north couloir reveals itself to be a reasonably wide snow gully dropping straight down at least fifteen hundred vertical feet. Somewhere beyond that, the couloir doglegs left and out of sight. From my vantage point here at the entrance, the visible pitch looks to be between 40 and 45 degrees in steepness. To our north, the horizon is dominated by Mount Baden-Powell—the couloir points straight toward it like an arrow. The snow in the belly of the couloir is streaked with dirt and dotted with rocks. Yes, that famous Southern California sun obviously got here first. 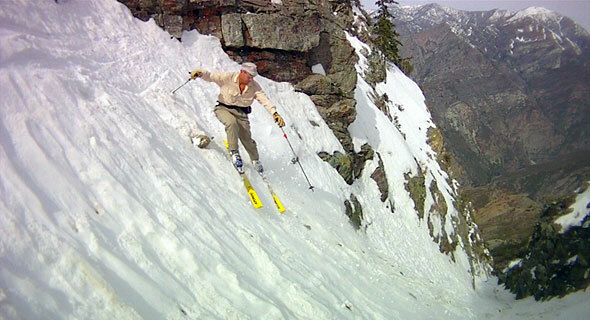 But there is no question now as to whether or not the couloir is skiable: it is. There is also no longer any doubt as to whether or not Iron Mountain's north couloir will ever be skied, because we're about to do so—right now. With Lou watching, Dave perches himself right atop the entrance with the camera. I drop into the couloir. And...the snow is far from the best I've ever had, but no matter. After all the effort we've put in to get here, this might just be the most rewarding skiing I've ever had—and fun! We're on a wonderfully steep and narrow patch of snow that drops literally to nowhere, down into the interior San Gabriel Mountains and the San Gabriel River Valley. The whole crazy enterprise has suddenly blossomed from crank concept to concrete reality. As for concrete, we are a preposterously-meager 35 miles from Downtown Los Angeles, yet simultaneously about as far removed from civilization as you can get. What's that? Say again...you're where? No, seriously, where are you? Iron Mountain? Skiing? On the north side? And just what the Hell are we supposed to do about it? I suppose it might be possible to put a helicopter skid on the summit, but that's about the best you could hope for. So make those turns with care! Lou decides to hang back below the entrance to the couloir and watch us, waiting to see if the snow improves when Dave and I get a little lower. Dave and I continue working our way down the couloir together. The snow does temporarily get a little smoother in the couloir's midsection. Soon enough, however, the skiing gets choppy again. Dave and I have a quick pow-wow in which we both agree the prudent thing to do now is to stop where we are and start climbing back up. But there's a wild grin on both our faces that says we're not quitting 'till we've seen this descent down as far as our skis will carry us. So onward we go, down, down, and down farther, until we reach the 6000' mark, and the snow at last becomes too soft and rock-pocketed to ski any farther. We're reached the dogleg, allowing us to see around the bend. The ski descent of Iron Mountain, alas, is over. But still: Excelsior! We've dropped over 2000 vertical feet down Iron Mountain's north side, in the process surely setting a high water mark in the annals of Southern California ski mountaineering wackiness—as well as realizing a dream that began three years ago atop Baden-Powell's no longer quite-so-distant summit. And look here above us: Lou has apparently decided he wants to get in on the fun as well. I see him making turns through the couloir's midsection, heading steadily lower. Dave and I exchange congratulations—and I give him a big Thank You as well. Dave's participation, in the end, has proven critical to making this trip happen, and to making it such a blazing success. I was never going to pull this off solo, I realize, and I was probably never going to find anyone else willing to come along, either. As for Al, Dan, and Bill, I find myself wishing they were here now to share this moment of triumph—they're a part of it too, even if it is in absentia. We fill our water bottles from a spring emerging from the black rock at the Dogleg. Dave asks if I have a name for the couloir. I do. In honor of the nearby Bridge to Nowhere, I want to call this 'The Couloir to Nowhere.' The name captures the feel of the place perfectly, I think—especially as I begin to contemplate the long climb ahead. After all, getting home from Nowhere isn't going to be easy.